I started with the obvious: boiling chopped potatoes. Regular old store-bought russet potatoes. (Third mistake?) After 15 minutes, they still seemed hard, so I set the timer for a five more minutes. (Need I keep counting mistakes?) By the time I strained them, they looked more like mashed potatoes. I immediately ran gallons of cold water over the colander, which sent a good percentage of my salad down the drain. Perhaps I should be thankful for this. 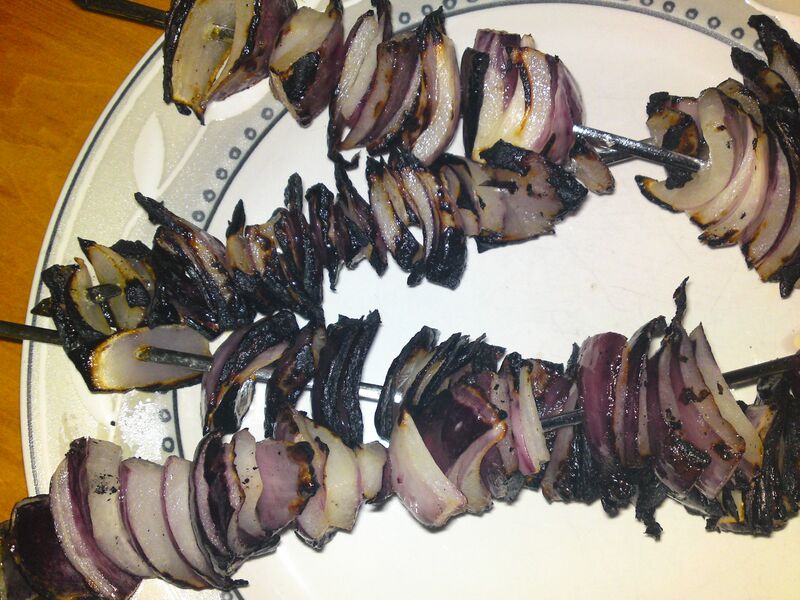 First, I sprinkled on some salt and doused the potatoes in olive oil, added grilled red onions and minced parsley fresh from the garden. Taste Test 1: Hmmm…. 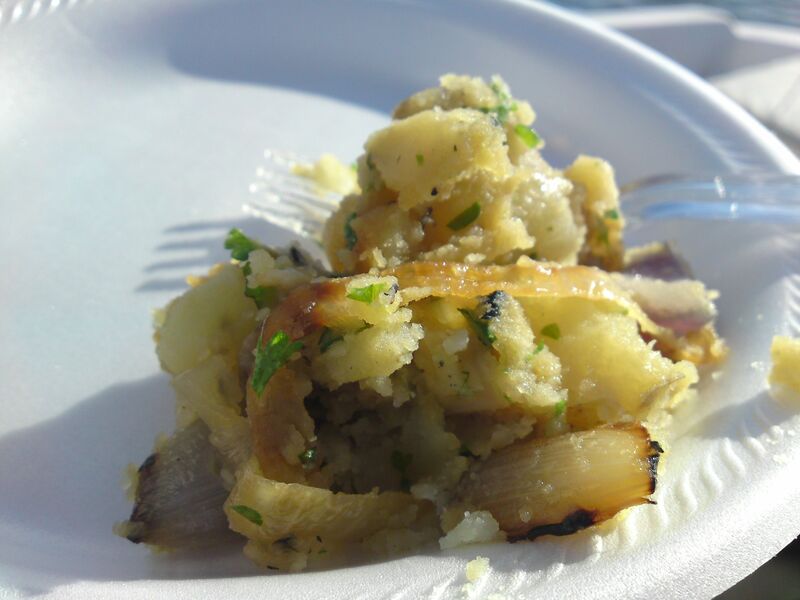 The onions (spritzed with olive oil and grilled) were great, but the potatoes tasted watery. And their texture was off–grainy, even. What did I do? Why, I added some fix-all (aka olive oil). Of course, I’d already planned on adding some olive oil, but I added some extra, just in case. Taste Test 2: Still missing something… like flavor. 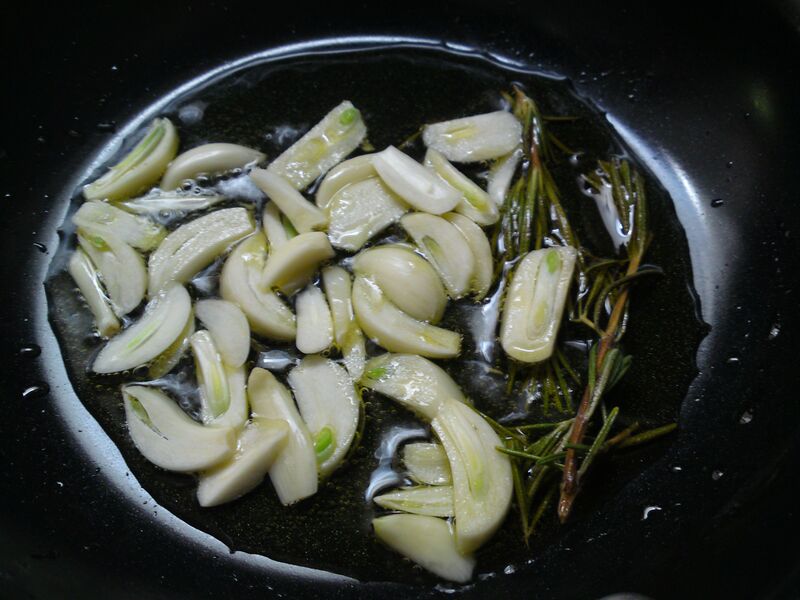 I sautéed a good number of sliced garlic cloves and fresh rosemary sprigs in more olive oil. At this point I brought out the big guns: caramelized onions. I can now assure you that there is at least one savory dish in this world that can not be saved by a healthy dose of Vidalia onions sautéed it in butter and brown sugar. I tried to get my husband’s opinion. He refused to touch it. I insisted, at which point he was kicking and screaming to GET OUT of the kitchen. My friends were kind. One even said it was good, but he’s a really nice guy. Let’s just say I came home with a lot of leftovers. 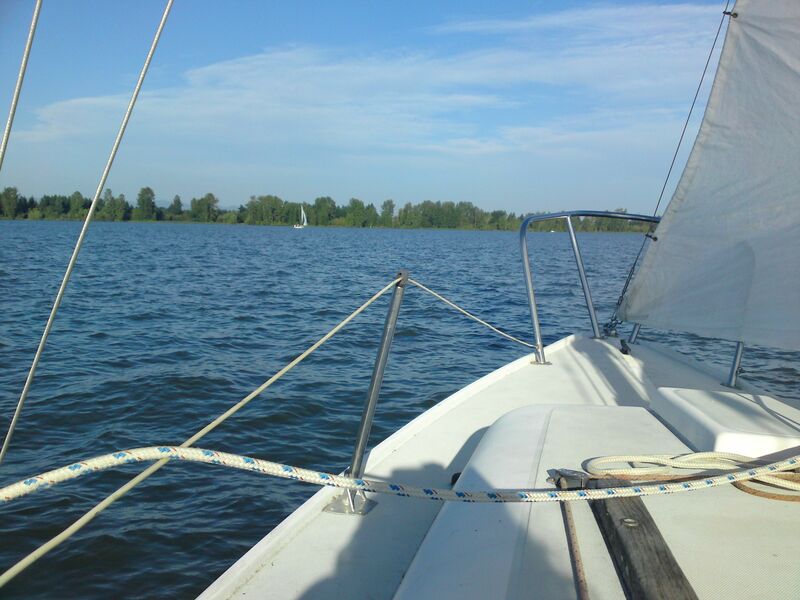 At least the lake was beautiful. I ate potato/onion mush for days. I even tried pawning some off on my mother, burying its hideousness under the sheen of chicken chunks sautéed in olive oil and garlic. Perhaps too much garlic; definitely too much oil. Mom and I echoed each other’s burps all afternoon. What would I do differently should I ever make potato salad again? Start with better-tasting potatoes, probably red and preferably homegrown. Add some salt to the boiling water. Get creative with the “sauce” by adding some mustard, a splash of white wine, and perhaps some balsamic vinegar. And I bet bacon would have helped. There were still remnants in the refrigerator a week later. When Stefano, who scours the refrigerator hourly for something to eat, still refused to touch it, and I couldn’t bring myself to finish off the last bowlful, it landed in the compost pile. Maybe the worms will eat it. P.S. Don’t tell my husband, but, in some sense, he’ll be eating my potato salad next year after I use that compost on my tomatoes! It is really encouraging to heard someone laugh at their mistakes. All of your dishes sound – and those I have tried – taste wonderful. It is good to know it is OK to make mistakes and laugh at them. Want crunchy or fluffy bits? Starchy. Want firm, structurally intact bits? Waxy. Thanks Jeremy. I will muster the strength to attempt this difficult dish once more, and your potato insight will certainly help. Yukon Golds — here I come! Hilarious, Kathleen! I’ll try your second-generation attempt at potato salad–with the invisible mayonaise, of course. Have you ever tried the purple potatoes? They’re the most spectacular (is that an oxymoron??) potato I’ve ever tasted. And they really are purple…don’t recall the name, though. They would definitely go well with the boat and lake, too! You should have made them into patties and fried them. That might have saved it. I like a mushy potato salad. Man, oh man. I bet even Stefano would have eaten those potatoes had they been fried! Good idea Nick. For future travesties, I will have to remember the frying fix-all. Congrats on freshly pressed! Your writing is great. 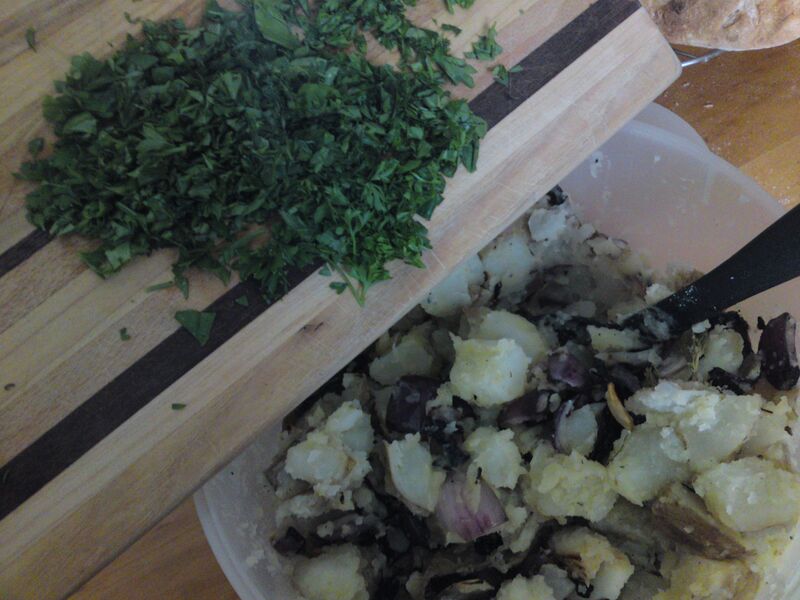 I make a mayo-less potato salad that gets rave reviews. Onions, celery and dill pickles chopped, along with hard boiled eggs and of course, potatoes. It takes a bit of olive oil (not too much) and plenty of lemon juice, dill and salt. I definitely agree that some friend potato fritters would have been great! Thanks Kalisis! Thanks for visiting. Dill pickles would have done wonders for my potato salad… rarely use them as my husband doesn’t like them. (Amazingly, they still let him immigrate to America.) He doesn’t like anything with vinegar, balsamic or otherwise. (Might be why they kicked him out of Italy!) Still should have used one or both anyway as he never even tried the salad… There’s always next time.